Fashion Maven... Mommy: City Cosmetics Dragon's Blood Beauty Elixir Launch Party - YOU COULD BE THERE! City Cosmetics Dragon's Blood Beauty Elixir Launch Party - YOU COULD BE THERE! Hello lovelies! It's been a very long, fun and exhausting two weeks! I loved our vacation in Portugal and can't wait to tell you all about it just as soon as I settle back in. In the mean time, I wanted to let you know about a wonderful opportunity for my wonderful readers via City Cosmetics! 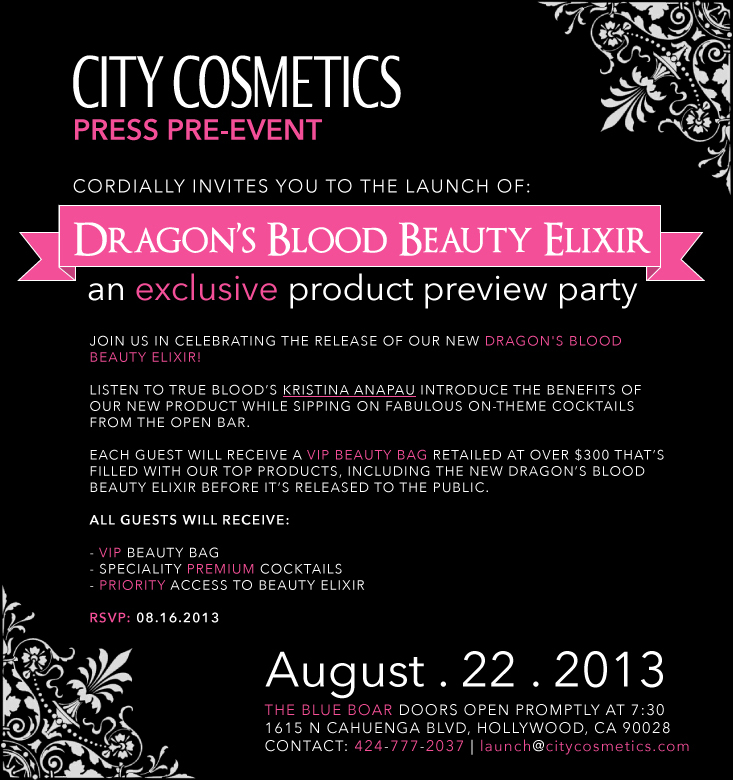 City Cosmetics is celebrating the upcoming release of their new Dragon's Blood Beauty Elixir in Hollywood on August 22nd and YOU could be there! If you're in the LA area, you could win an invite where you'll enjoy signature cocktails, a VIP beauty bag that retails for $300 filled with City Cosmetics signature favorites while listening to True Blood's Kristina Anapau chat all about the benefits of Dragon's Blood Beauty Elixir! If you're not in the LA area, worry not! You can score a Dragon's Blood Beauty Elixir Gift Set! To enter, simply fill out this short form! It's quick, easy and who knows... you might WIN! Head on over to City Cosmetics and check out why True Blood's Kristina Anapau calls their products 'magic in a tube' and are must-haves for celebs Teri Hatcher, Fergie, Vivia Fox and more! Also, check out my review of CityLights here! GOOD LUCK! Exciting...too bad I am not from the area! That would be an awesome event to attend! Welcome back and I can't wait to see pics from your trip!